Meet the dynamic husband-and-wife team that blends engineering excellence with enterprise. They do so while dedicating their lives toward the advancement of young and emerging engineering talent. They are community leaders and pace-setters for our region's growth. Abe and Nicole Adewale of ABNA Engineering are with us today. Abe and Nicole Adewale, founders of ABNA Engineering, a civil and structural engineering firm. They design for industrial, educational, healthcare and ... See More commercial projects and provide surveying, Geotech, construction management, testing & inspection and planning for major public works projects. 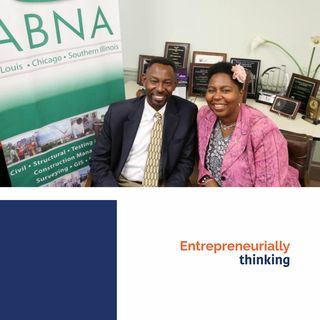 Abe and Nicole founded ABNA Engineering in 1994 after a decade of service at the Illinois Department of Transportation working on major roadway and bridge construction projects. -What engineering represents to each of them. -How and why did it engineering emerge into entrepreneurship for the Adewales. -What is their overarching business philosophy. -What are some of the challenges they've experienced along the way. -How did they step out of their comfort zones. -The importance of minority inclusion in business development. -What does that mean for the Adewales to be leaders in the community and what that involves. -How they find balance with family, work, community. -The lessons they've learned that they want to infuse in emerging engineers. A Full Service Civil Engineering Firm - St. Louis and Chicago.